The commercial lemon industry got its start during the California Gold Rush to help in the prevention of the Vitamin C disease scurvy. 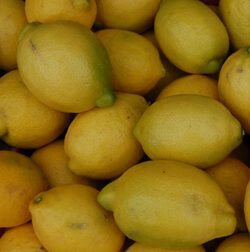 Lemons are great for juicing and turning into lemonade. To get the most juice from a lemon, first bring the fruit to room temperature and roll on a hard surface while pressing down on the lemon – or – Microwave for 30 seconds to increase juice content.